We spent some time with our friends and got our rig Minnie Pearl un-winterized and ready to head on some adventures. 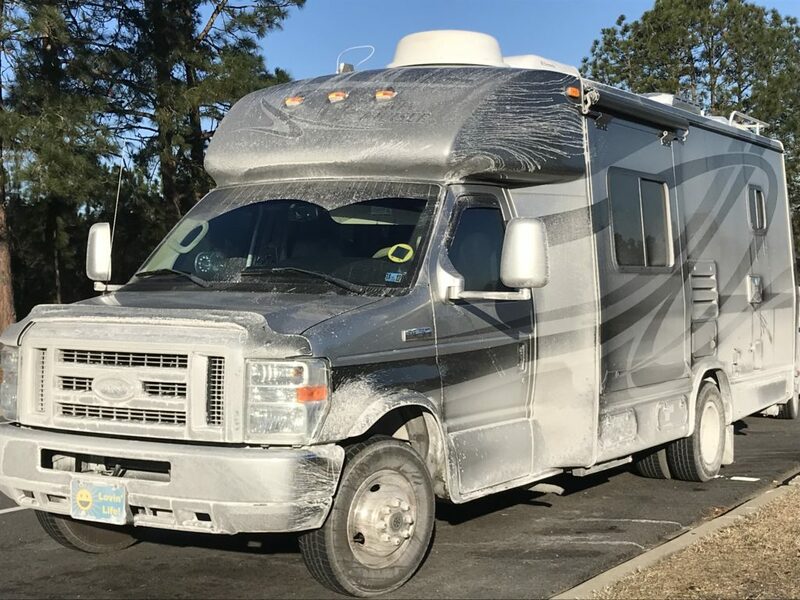 The car and motorhome had to be thoroughly washed to get all the salt off. 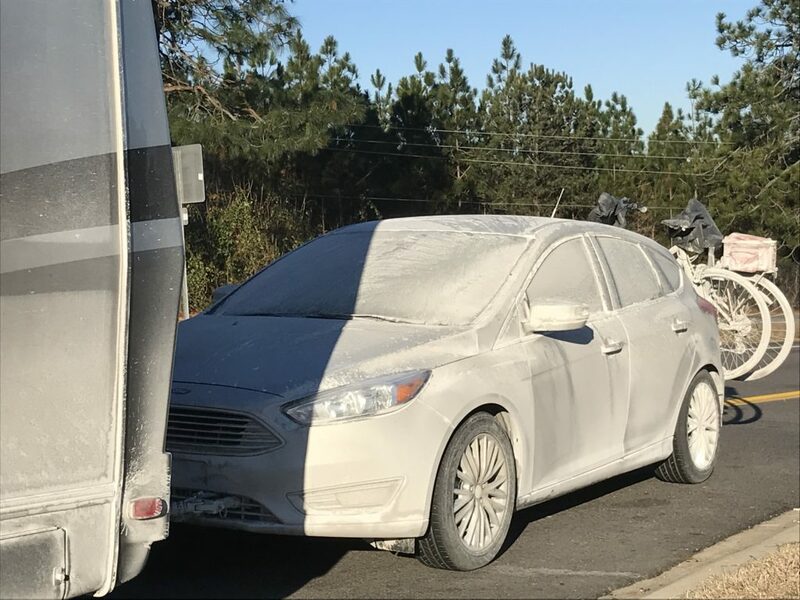 It took three tries with the car, it was absolutely filthy – the salt stuck on like glue! One thing we really wanted to do this trip in Florida was to buy some Honey Bell oranges. A good friend in Delaware has talked about these oranges and we wanted to try them ourselves. The Honey Bells are only available a few weeks a year! 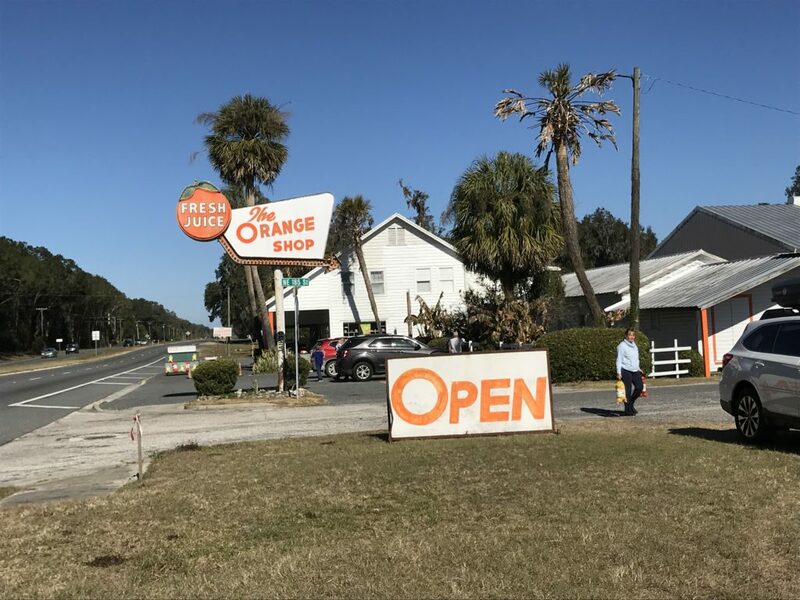 We went to the Orange Shop in Citra FL and sampled lots of oranges and grapefruits! 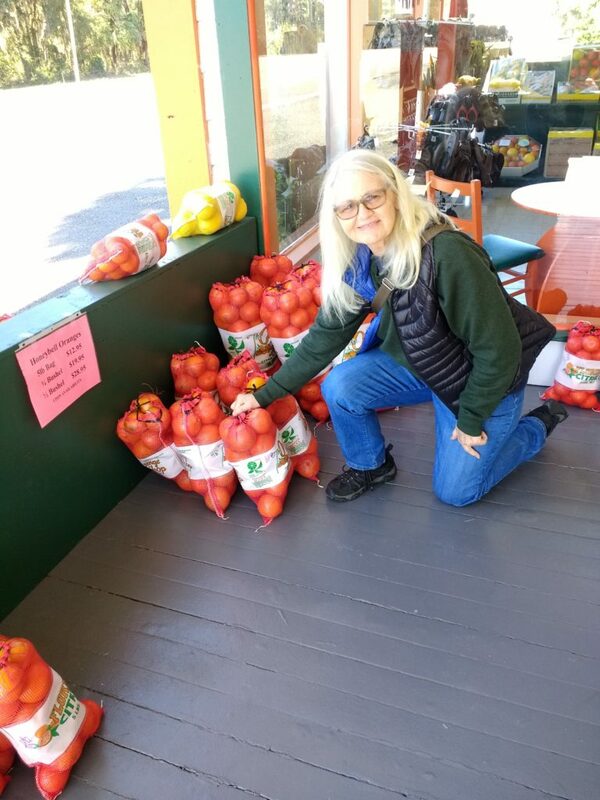 We bought a bag of Honey Bells and a bag of Ruby Red grapefruits. YUM! 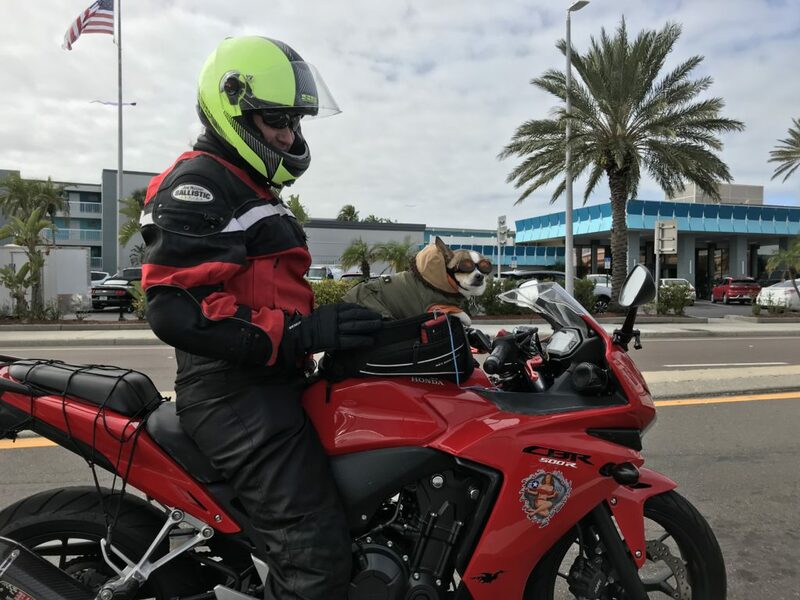 Onto Fort Meyers and a Big Surprise! Heidi’s pretty good about going with the flow as well. 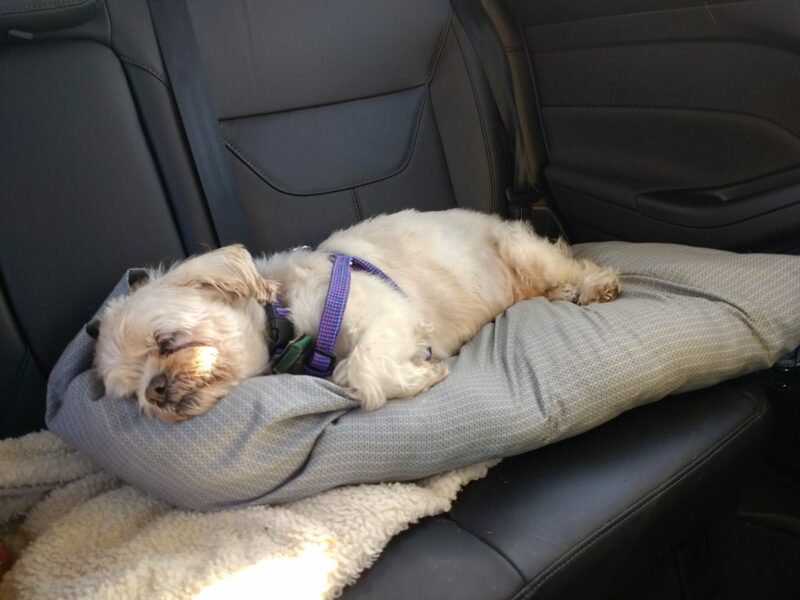 She chilled out on the 5 hour road trip to Fort Meyers. 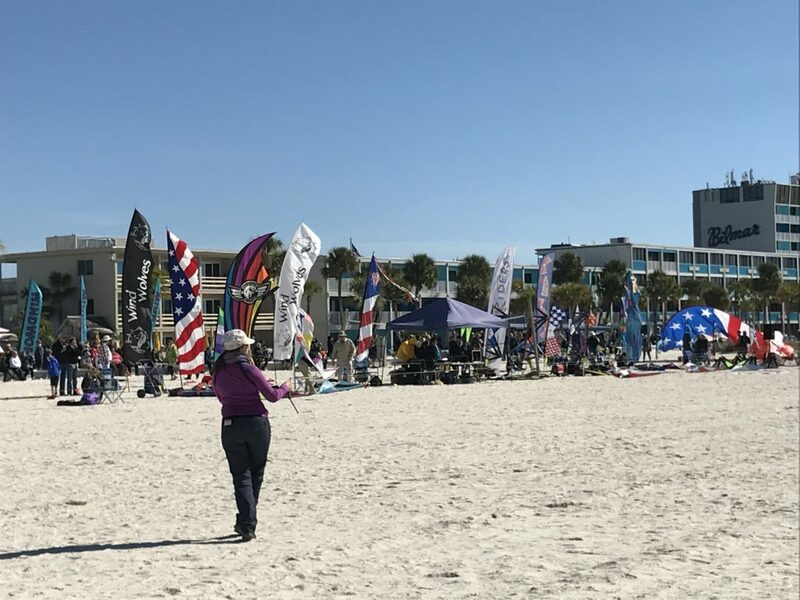 Our next destination was to Treasure Island, FL to attend the 2018 Treasure Island Sport Kite Championship. 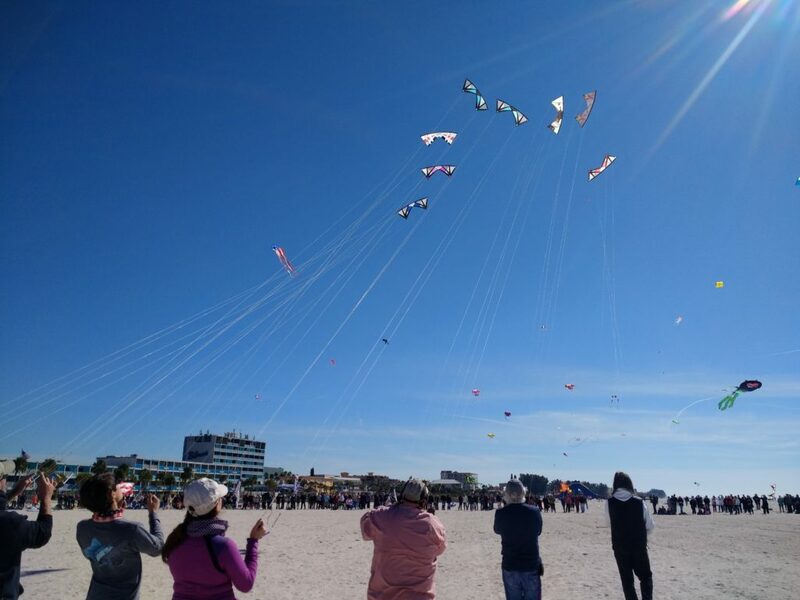 It was sponsored by the Eastern League Sport Kite Association. 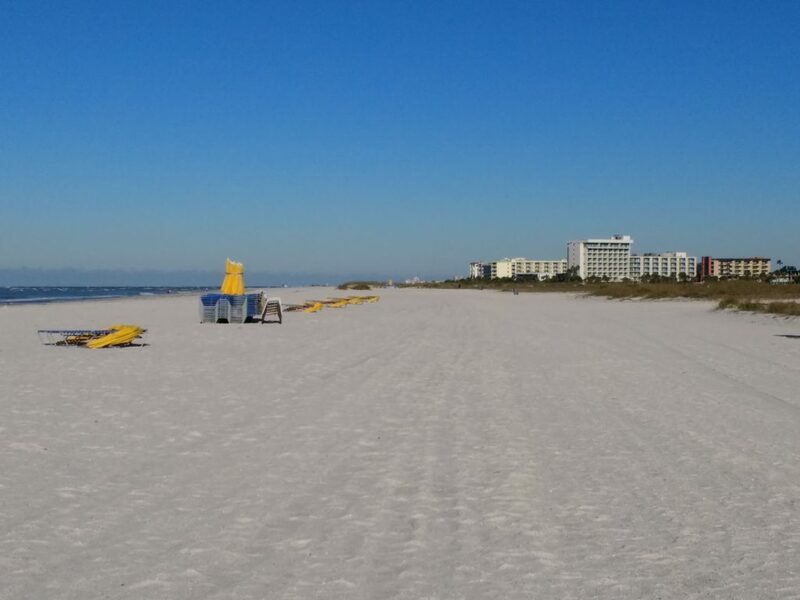 The beach at Treasure Island was beautiful. Plenty room to fly kites! 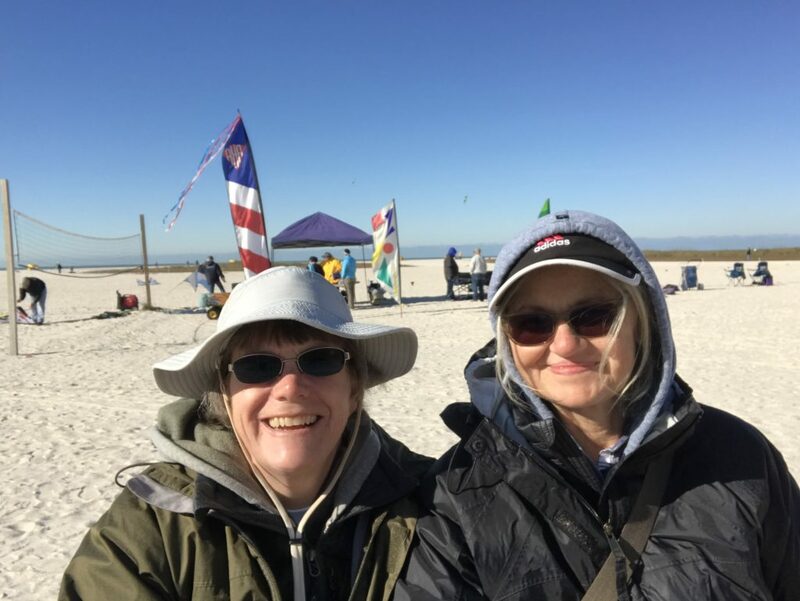 We have been to several sport kite competitions in Ocean City, MD; the Outer Banks and have especially enjoyed the Great Lakes Kite Festival at Grand Haven State Park in Michigan. We saw several people we have met at the other festivals and competitions here in Treasure Island! The kite ballets are our favorite event, where the kite flies to music and the flyer interprets the song into beautiful moves in the sky. We spent two full days at the festival and it was quite chilly! 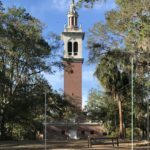 One morning it was 39 degrees with the winds at 10 – 15 mph. The sun was out on the second day and by the afternoon the sky was filled with great big stationary kites while the competition with the stunt kites was going on. 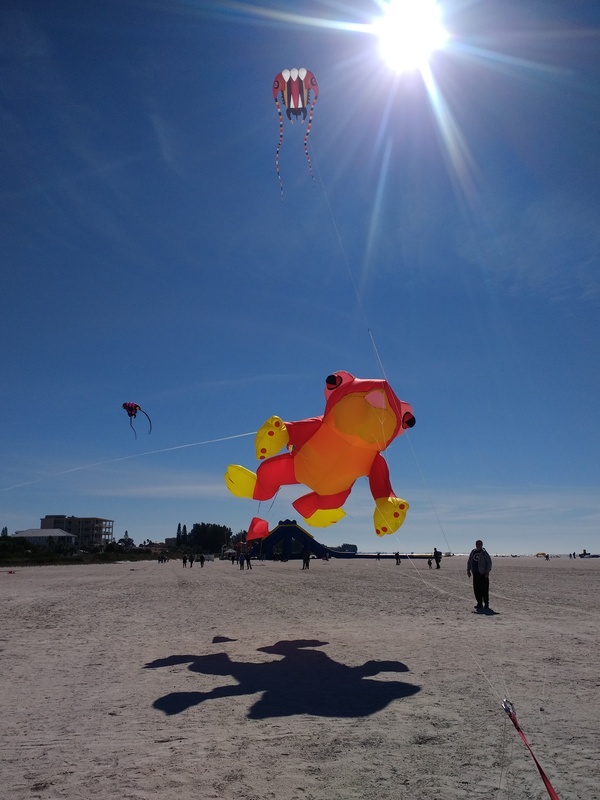 Some of these kites are huge – there are some people in the pictures to give you some perspective. We fly Revolution kites as you may remember from last years blog. 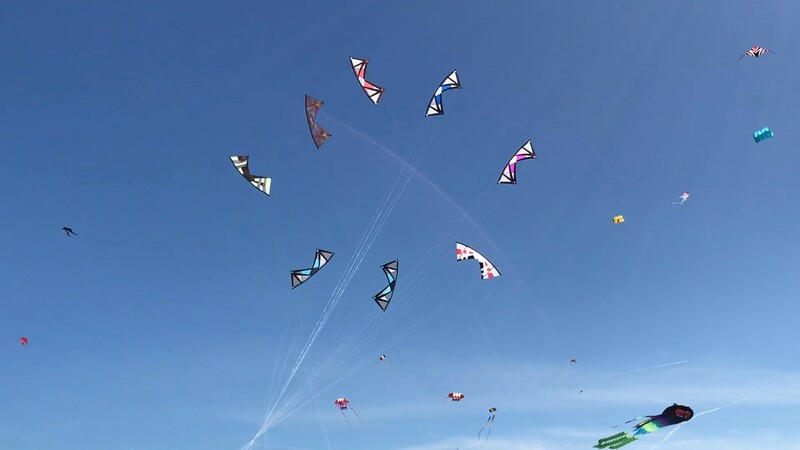 We especially enjoy seeing a large number of Revolution kites flying together to music. This is a group called the RevRiders. 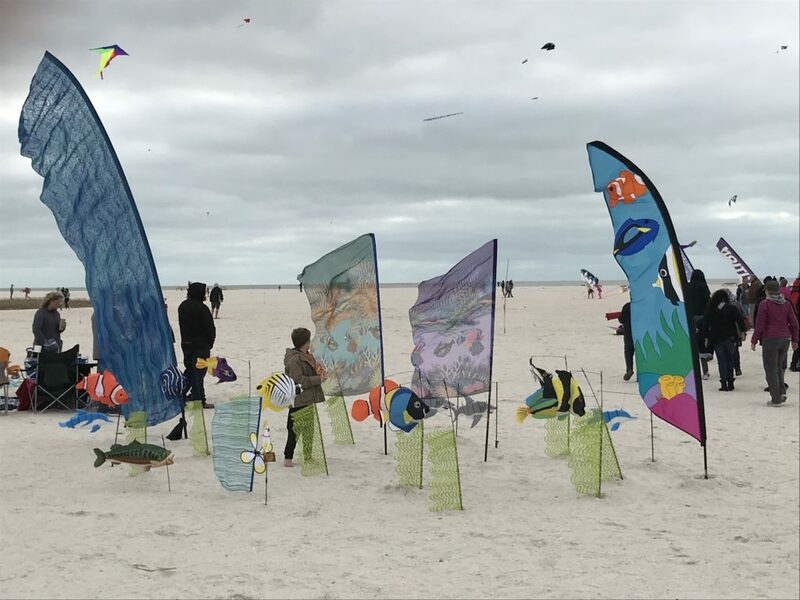 The Rev Riders – 8 kites! Look at all those lines! They stand beside one another and fly in unison. This is called team flying. The Revolution kites are shaped like a bow tie and have four lines attached to two handles. In team flying the lines are approximately 120 ft. 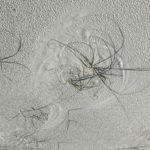 Multiply that times eight and that’s a lot of lines in the sky that could get tangled! It requires quite a bit of skill and control, but they made it look easy! The Rev Riders flying in formation to music. What a lovely site! Our friend Lee, from Erie PA was at the festival and he had his stack of Revolution kites in the sky. He is a master at kite flying and can make the kites dance and has extremely good control. It is fun watching him interact with the crowd. 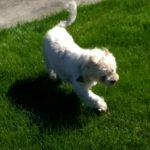 We stayed at a nice dog friendly hotel about 5 blocks from the festival. We had a kitchenette, so we only went out for dinner both weekend nights. 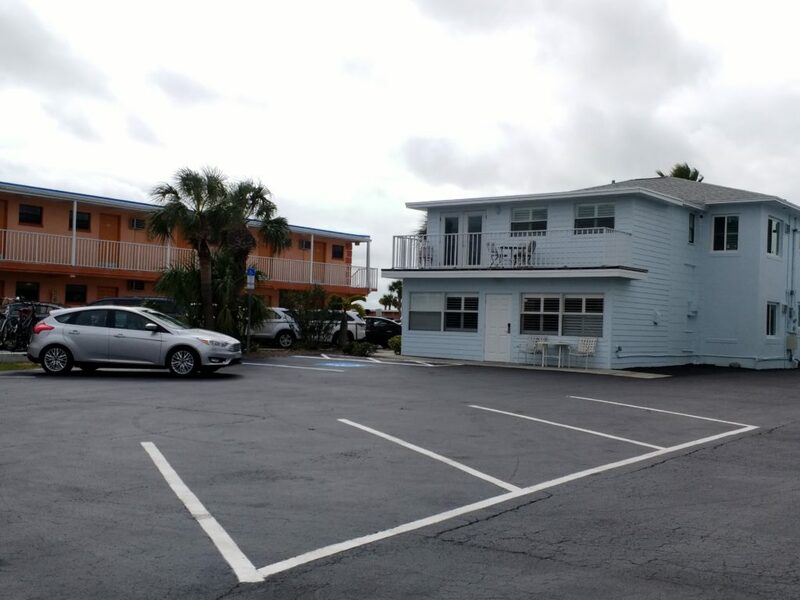 The hotel was modest but clean and extremely convenient to the festival. We did have a view of the water and a great place to walk Heidi. 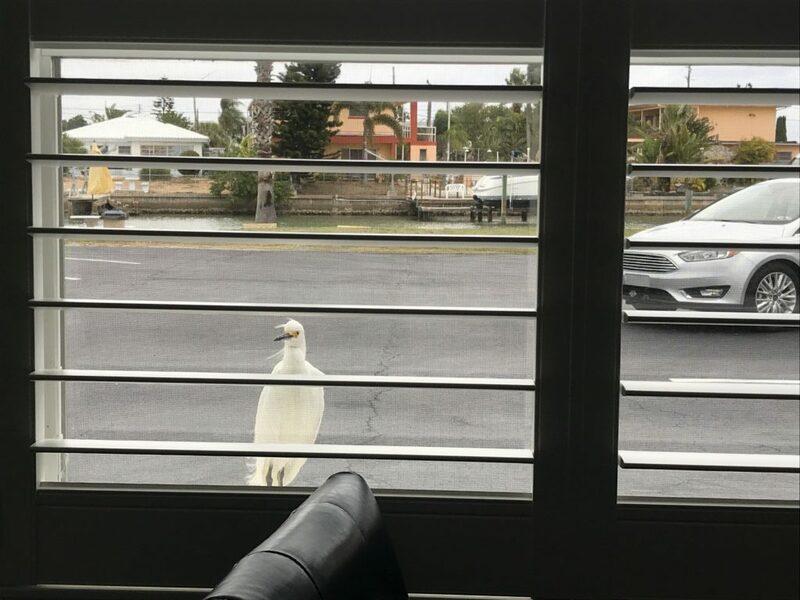 Kathy was cleaning up from breakfast when she looked out the window and saw something looking at her! This Snowy Egret was looking right at me! I was out taking Heidi for a walk, when I captured this picture. 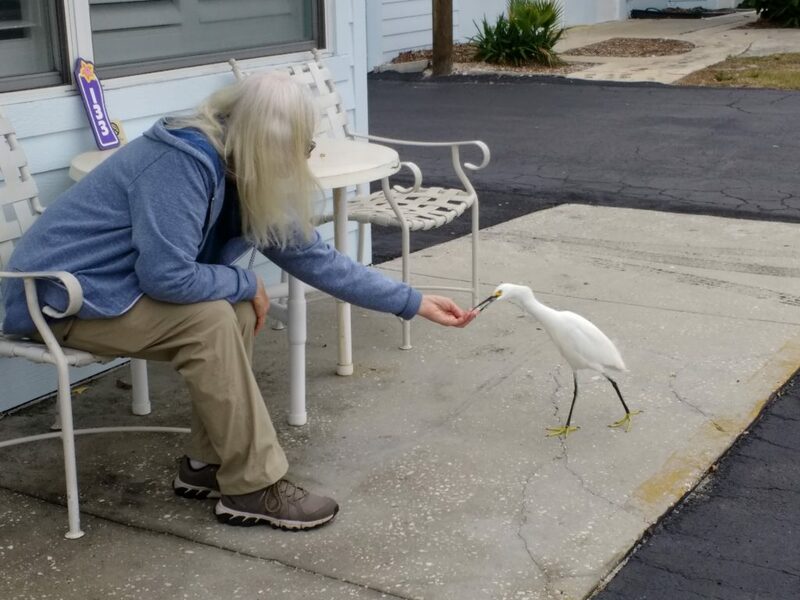 Kathy made a friend and called him Sammy. This was a special memory and we enjoyed giving Sammy some doughnuts. After his belly was full, he went on his way. Treasure Island was a hoppin’ place and we enjoyed the energetic vibe. And it’s always fun when you see some interesting and unique people. This lady pulled up beside us at a traffic light. 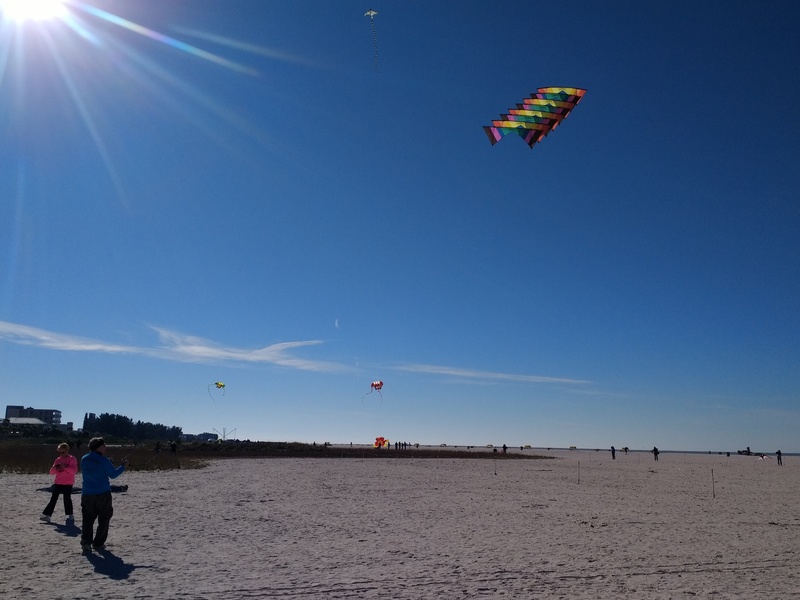 We are looking forward to spending the month of February here to explore the area more and get some kite flying in! We have been busy the last few months preparing for our winter trip. 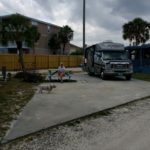 It is so exciting to begin another journey in our motorhome, Minnie Pearl! 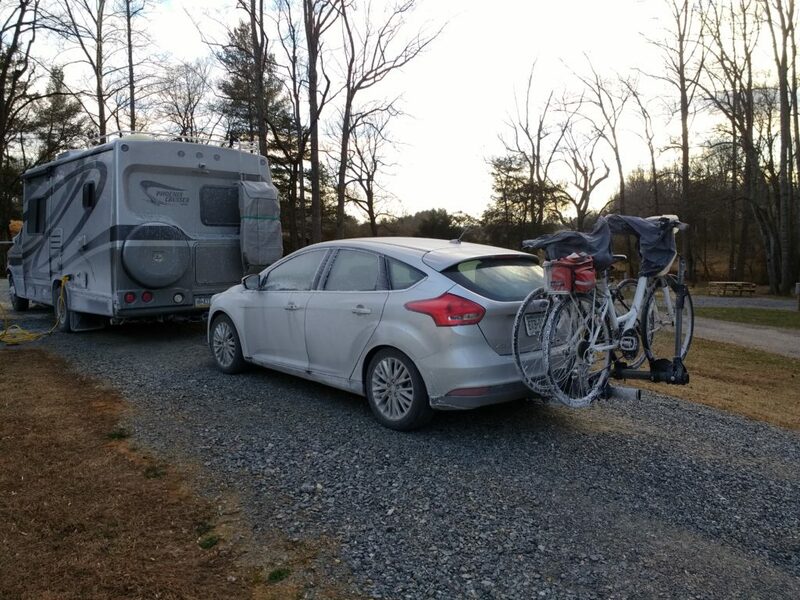 The biggest change this year is that we will be towing our car with us – commonly called a TOAD. 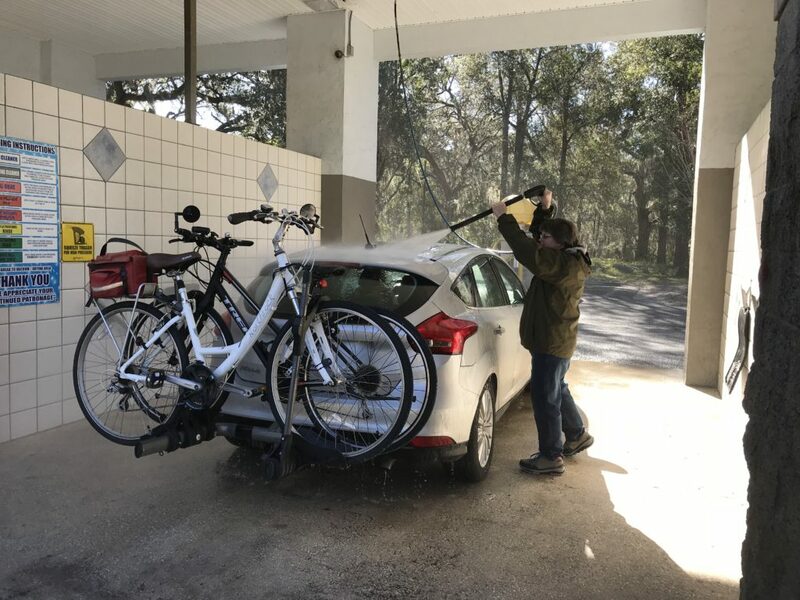 Our friends in Florida gave us their Blue Ox tow bar and Brake Buddy and we were able to use those pieces to get everything ready to go. 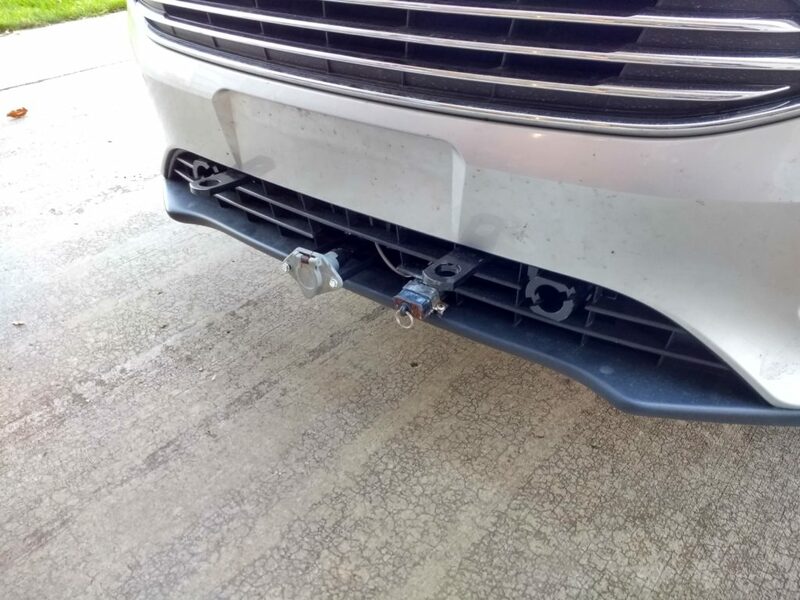 We had to buy a base plate to install on the front of our car so that the tow bar could attach to it. While we were at the RV shop, we took some pictures of the installation. Here’s the rig in our driveway after our first trip home from the shop. 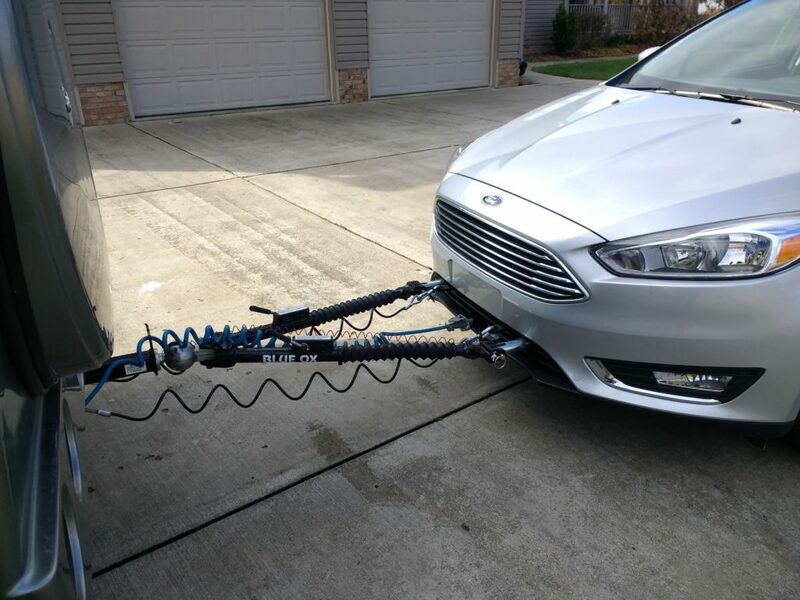 In preparation for towing our car one thing we did was install a 5-star tuner. This is a custom tuning to the engine chip to enhance performance. The stock tuning for our E-350 van is for a lightweight van. 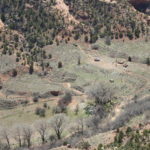 Our motorhome is around 12,000 lbs., and it dogged going up hills. We were concerned that it wouldn’t have enough power to pull the car in mountainous areas. The tuner was pretty easy to install. The tuner came in the mail and I followed the instructions to obtain some information from our engine, which is the Ford Triton V-10. I then sent the information to 5-star Tuning and within a few days we had the software program specific to our vehicle. 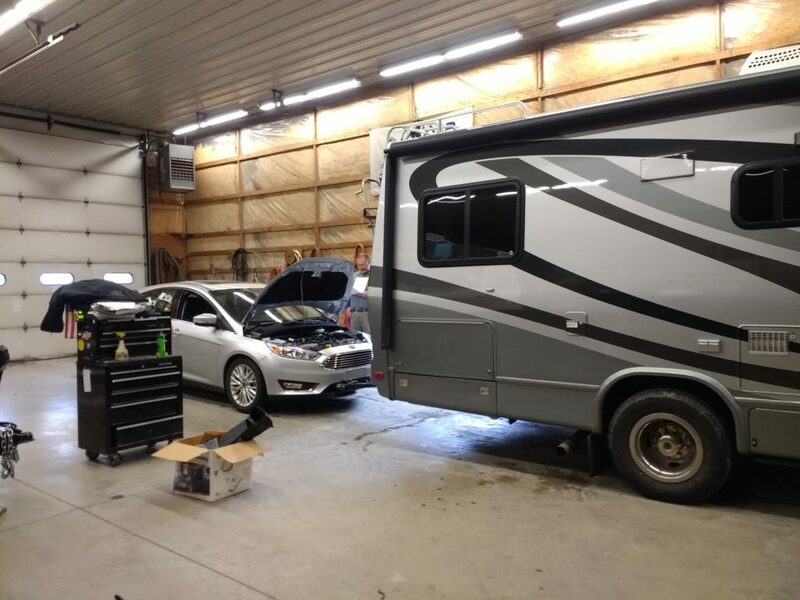 After installing the software onto the tuner, we took the tuner out to the motorhome and plugged it into the OBDC II port under the steering wheel. It walked me through installing the new tune software and then backed up the original factory tune. 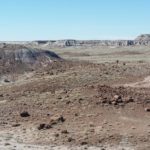 The test drive around the area proved that we had a little more pep and the shifting points were better. When we towed the car home there was no lag or slowing down in the steeper hills. We will have to see the overall performance, but so far, we are happy with it. Minnie Pearl has a macerator system for dumping. For those who don’t know what that is: the macerator grinds the black matter (poop!!!) and disperses it through a hose at the dump station. We really like it. It makes dumping effortless. It’s all self-contained and there is no setting up, unhooking and cleaning a large hose. The drawback of the macerator on Minnie Pearl is that there is a rather low ground clearance and we have damaged it twice. Now we are extra cautious while making a left turn going up hills or when going over areas with lots of ruts. The first time we damaged it, I installed a new macerator system. It was a bit labor intensive as the electrical wiring had to be re-configured for the new pump. It worked great until not too long afterwards, we damaged it again. The second time I was able to order a specific part for it under warranty and it was much easier to fix. 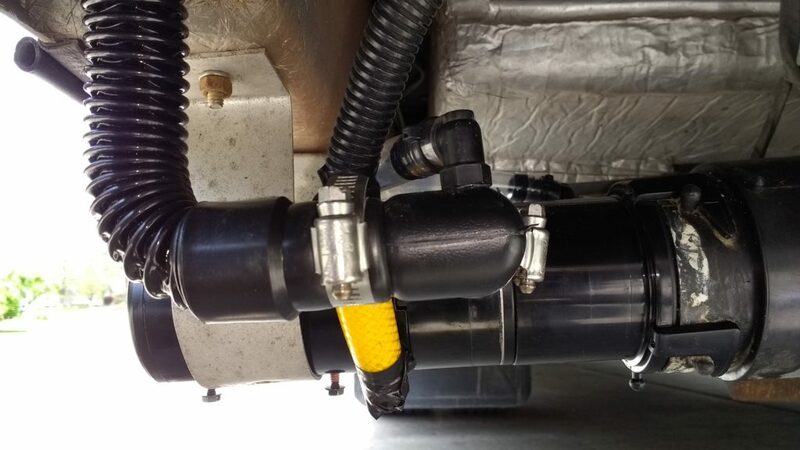 I asked Phoenix about this design flaw and they said that for some of the models of motorhomes, the rear placement of the bathroom necessitated the macerator being very far aft. This causes the potential of a bump of the macerator pump when backing up or going over bumpy areas. The suggestion to prevent some of the potential for damage is to install skid wheels on the back bumper. We may get this done next time we visit the factory. For now, we just intend to be super cautious when backing up or going over bumpy areas. As a backup, we do carry the standard “stinky slinky” 4” hose and can use it without the macerator pump. 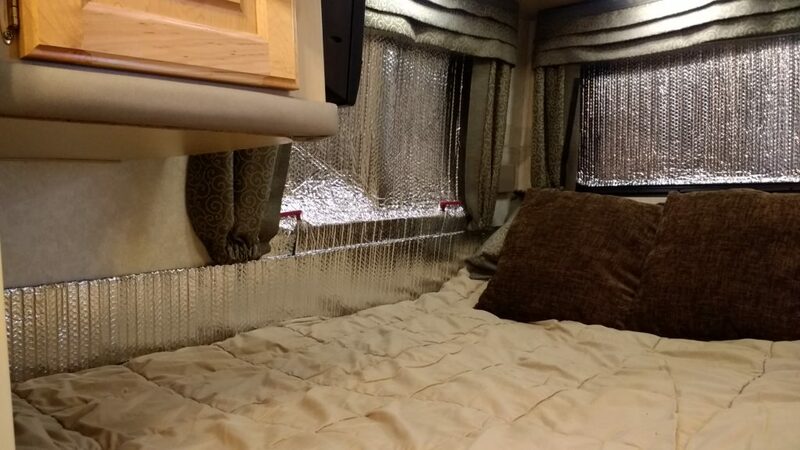 It’s really annoying when the blinds in the motorhome won’t stay up. Last year towards the end of the trip, there was a large blind that would not stay up. We used Velcro to wrap around it as a temporary fix. We considered buying new blinds, but researched it and saw that they could be repaired, even though it could be a tedious task. 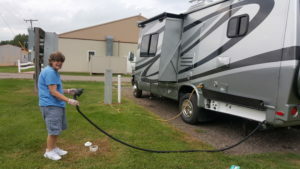 Thanks to the RV Geeks instructional video, the job wasn’t too difficult. Now the blinds are in good working order. We had purchased a blind repair kit at Camping World over the summer which had enough material in it to repair 5 blinds. The key thing in repairing the blind according to the RV Geeks blind tutorial is to document how it is currently strung while you take it apart. 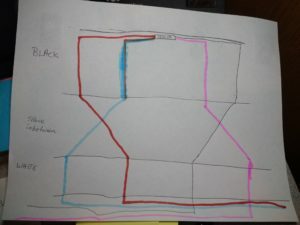 They suggested drawing a diagram – we did that and used color coding as the strings crisscross numerous times. 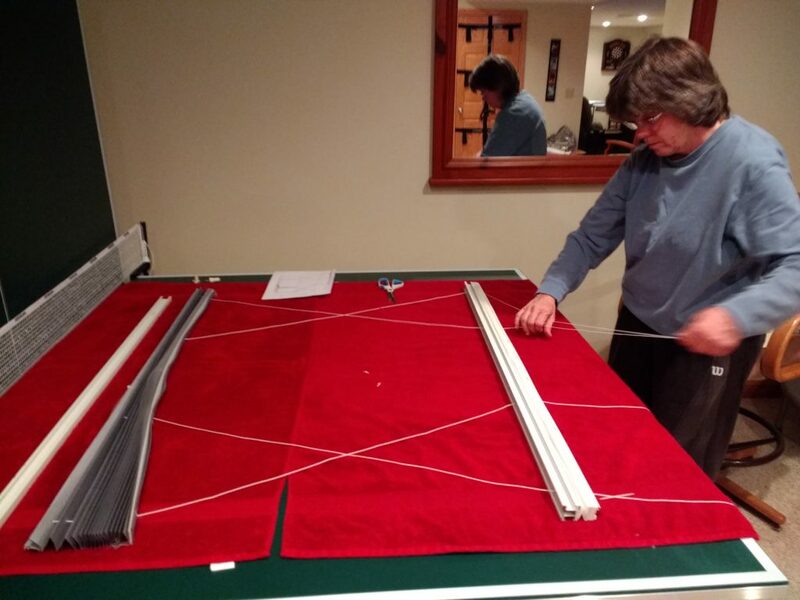 We had to replace the strings in a large blind, it took about one hour and was not bad! The blind is only about 18” long and it took about 6’ of string for each of the 4 lines! We had another blind that also needed attention, and we were able to adjust the tension on the knots on that one because the strings were not worn. Yeah! One repair down…. many more to go. Last year while camping in Quartzite and the Chiricahua National Monument, there were mornings it was downright cold! 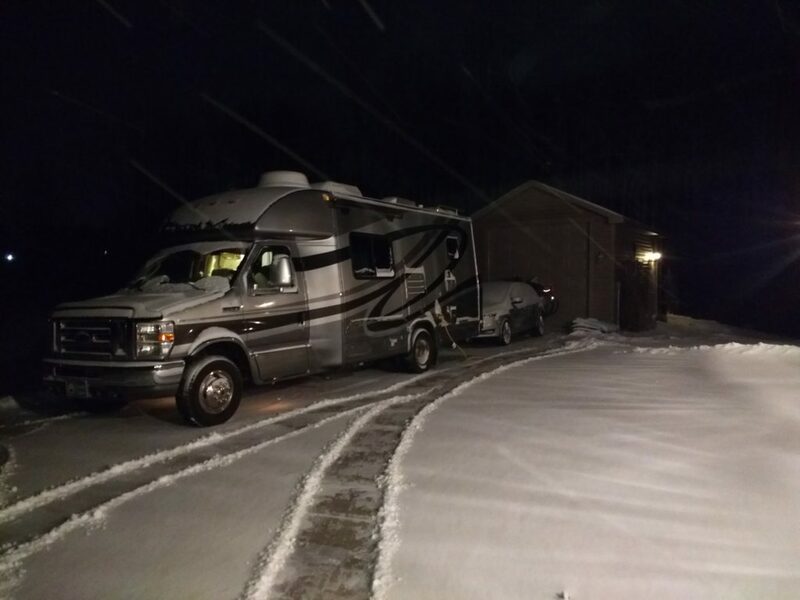 Even with our Mr.Buddy propane heater, when you wake up with an inside temperature in the 30’s, it takes a while to get the inside of the RV warm. 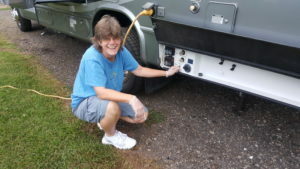 We talked to one of our RVing Women friends, Susan, and she showed us the inside of her rig. She uses Reflectix panels cut to size for the windows to provide insulation over each window. Reflectix is a foil insulation with packing bubbles inside of it! Then she covers the window area with a wool blanket pinned to the curtains around the sleeping area. We have cut Reflectix panels for all our windows and added some pieces around the bottom edge of the bed on the outside walls. 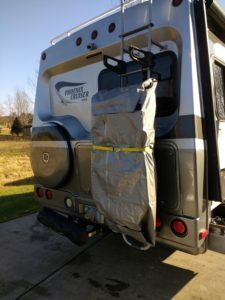 It was not hard to cut, and we hope it will add a lot of warmth to the RV this year. We bought new camping chairs for this year’s trip! Believe me, it was not an easy process – you won’t believe how many chairs we tried out! While camping with RVing Women friends this summer in Ohio and, we tried out all their chairs along with many others at stores. We liked one chair our friends had, and it was from Camping World. On our trek to the Camping World in Akron, OH this summer, we found the same chair and bought two of them. They are full size, light weight (7 lbs.) folding chairs. 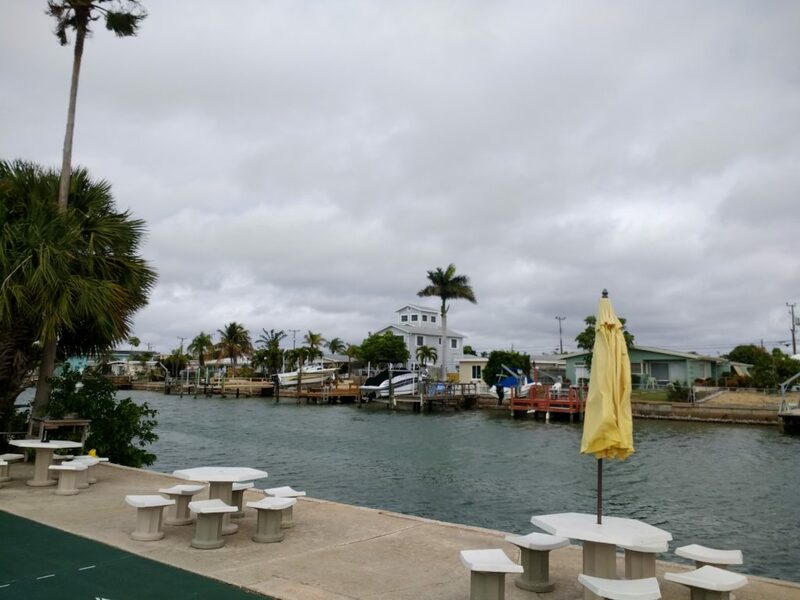 We are looking forward to getting out of the winter weather soon! It is frigid here in northwest PA and the cold weather is making it difficult to pack our things for fear of freezing! We can’t take numerous things out to the camper yet so the last day or two will be busy. 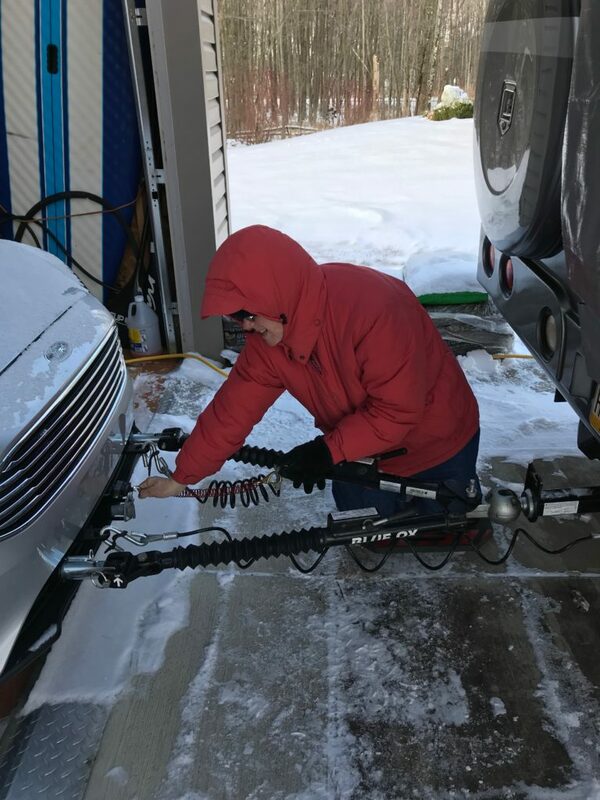 A couple of days ago we ran two space heaters in Minnie Pearl prior to going out and in a couple of hours the inside temperature rose from 11 degrees to 31 degrees! Still to cold to stay out for very long! 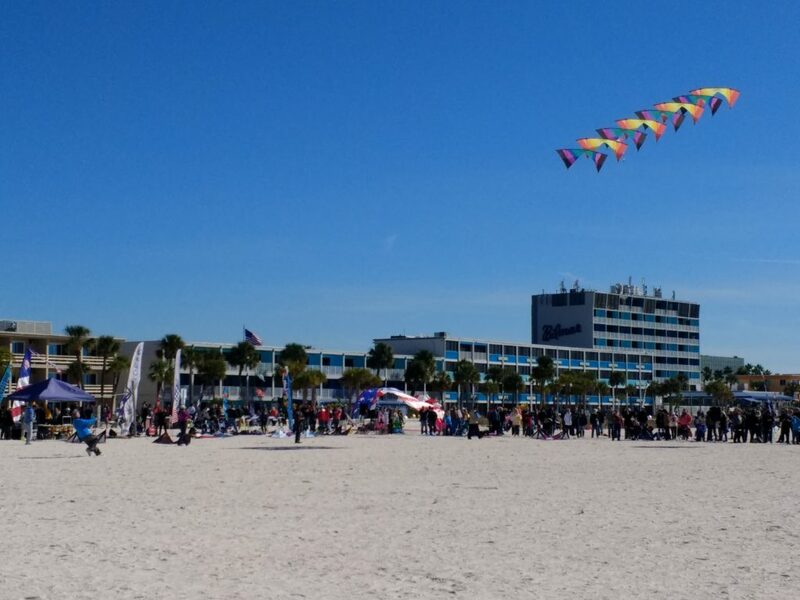 We will be heading to Florida soon and seeing friends and family, enjoying some kite flying and watching, and camping with our Florida friends for 2 weeks! 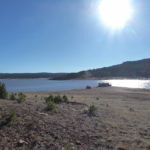 Then we will be heading west to enjoy some time in Texas and New Mexico. We will keep you posted! Our Journey has come to an end! We have arrived! Visiting Friends!